Heat oven to 400°F. On ungreased large cookie sheet, place 4 of the tortillas. Sprinkle 1/2 cup of the cheese over each tortilla. Top each evenly with turkey and cranberries. Sprinkle 1/4 cup remaining cheese over each. Top with remaining tortillas. In small bowl, mix melted butter and parsley. Brush butter mixture over tops of filled tortillas. Bake 6 to 8 minutes or until cheese is melted and edges begin to turn light golden brown. Cut into wedges; serve warm. 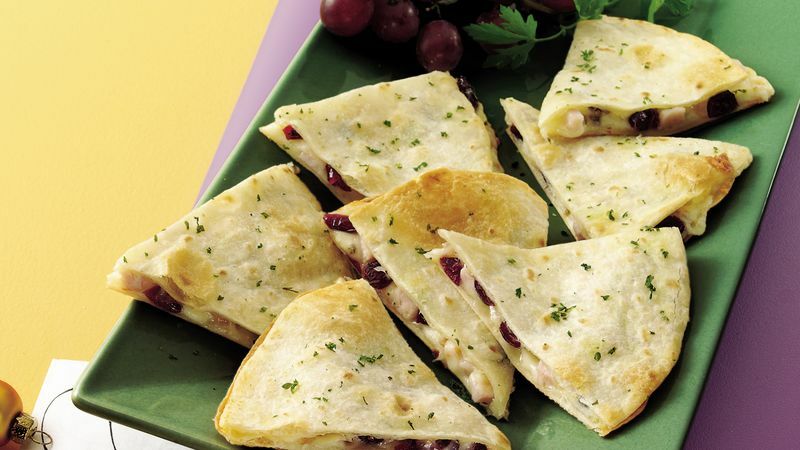 One quesadilla could also serve as a light meal with a bowl of your favorite hot soup.